Any experienced climber or outdoor person can tell you: no piece of gear in your arsenal is as important as the humble carabiner. Knowing how to choose the right carabiner will ensure you have the right tools for every climb or outdoor getaway, and it can help prevent you from seriously injuring yourself. But, how do you know how to choose the best carabiner? Believe it or not, there’s a lot to know about these tiny devices. So, before you go shopping for the best carabiner, familiarize yourself with the most important aspects of a carabiner; the shape, the gate, and the size, shape, and weight. If you’re looking for a quality general duty carabiner that will get the job done affordably, these Montem Ultra Sturdy Locking Carabiners may be a strong choice for you. The knurled screw-lock is large enough to control with one hand easily and it comes in an attractive color. This two-pack carabiner includes two identical screw-lock carabiners that are rated for up to 5kN (1,100 pounds). Each one is crafted from 7075 aluminum, and liberally powder coated in matte black. It would be nice to see if they come out with more colors. The gate is easy to open with one hand, and the snag-free design is particularly helpful as it can keep you from snagging and ripping or tearing any expensive materials that may get trapped inside the gate. These carabiners are a favorite of ours for general use like attaching gear, hanging a hammock or general campsite use. 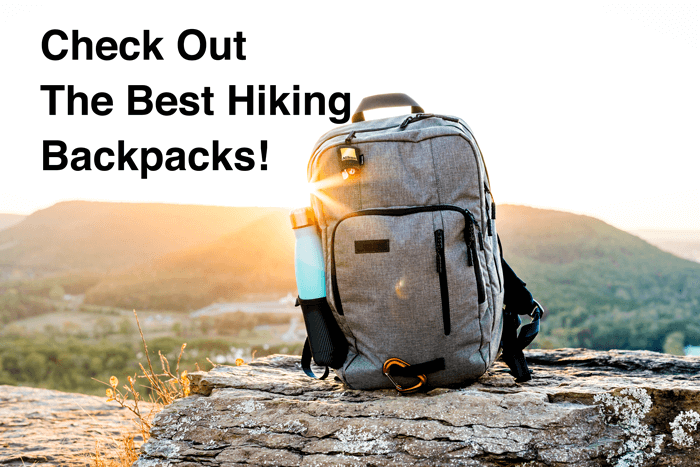 However, they’re not for climbing, so read on if you’re looking for other carabiners better suited to serious enthusiasts. If you’re looking for a quality general duty carabiner that will get the job done affordably, these Rallt wire gate carabiners may be a strong choice for you. This two-pack carabiner includes two identical wire gate carabiners that are rated for up to 10kN (2,248 pounds). Each one is crafted from aluminum, and liberally powder coated in matte black. The gate is 304-grade stainless steel, which will resist corrosion and damage from the elements. Omega Pacific has been one of the industry standard carabiner brands, and they produce some of the strongest and most trusted carabiners on the market. 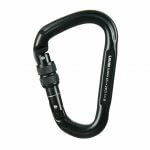 The Omega standard D locking carabiner is no different, and it’s favored by recreational climbers as well as rescue professionals, as well. This ‘biner is rated up to a massive 31kN, thanks to it’s ISO cold-forged construction. According to Omega, their construction process ensures that the area of the carabiner that bears the majority of the load is the strongest area. This translates to one of the strongest and most durable carabiners on the market. The screw lock adds a layer of security, although it isn’t as quick and easy to lock into place as auto-locking models. That said, it’s still hard to beat this carabiner on price, functionality, and durability. 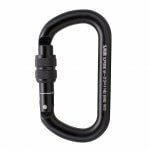 The Positron Screwgate from Black Diamond is an industry leading carabiner that’s favored by climbers of all skill levels for its ergonomic, lightweight design and ease of use. Despite it’s more diminutive size, this ‘biner is nearly as strong as the Omega Pacific model above. This one is rated for up to 25kN, which is strong enough for virtually any purpose. It also manages to pack a wide gate opening into its small frame, at 21mm. 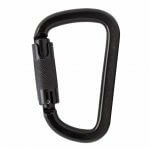 The keylock on this carabiner makes it virtually impossible for it to snag on anything, and it’s clear that Black Diamond took their time to develop a top of the line closure that’s quick and easy to use. The knurled screw-lock is large enough to control with one hand easily. Serious climbers have trusted the Petzl name for years, and their Attache series of carabiners blends high performance and value to provide one of the leading carabiners on the market. The Petzl Attache carabiner is crafted from high-strength aluminum rod stock for superior durability and lighter weight. These carabiners are rated up to 22kN. The Attache is small, but it still has 20mm of gate clearance, which makes it useful for virtually any climbing application. Meanwhile, the wide, symmetrical top is ideal for use with a Münter hitch. Similar to the Positron from Black Diamond, this model also has a well-designed keylock that makes snagging an afterthought. Like the Positron, it also features an oversized, heavily knurled screw-lock, which is easy to control with one hand. A visual indicator band is painted onto the gate so you can tell at a glance whether or not your ‘biner is locked or not. This auto-lock carabiner from Trango packs intuitive features into a small frame, making it a favorite for virtually every type of climber. This ‘biner offers the largest gate clearance of any we’ve covered. At 23mm, this model is ideal for HMS applications as well as anything in between. 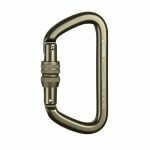 WIth a rating of 25kN, this carabiner is plenty strong enough for any application. The Regulock auto-lock functions smoothly and provides a secure lock, every time, which offers peace of mind when you need it most. Although this model is sleek looking, it is a bit heavy. Thanks to the auto-lock, it weighs in at 91 grams. If weight isn’t a major concern for you, the Regulock may be a good choice for you thanks to its durability and versatile design. The shape of a carabiner is an important consideration to make, as different shapes are intended for different applications. There are four carabiner shapes: Asymmetric D, standard D, Pear, and Oval. One of the most popular and versatile types of carabiners, the asymmetric D shape is characterized by it’s offset ‘D’ design. Their shape adds to their versatility, although this particular shape isn’t quite as strong as a standard D carabiner. Asymmetric D carabiners are also known for being strong and lightweight, similar to those carabiners used to support hammocks and hammock nets. The original D shape carabiner remains popular for certain applications, although its popularity has waned thanks to the advent of the asymmetric D shape. These ‘biners tend to hold weight along the spine, instead of the gated side, which makes them the strongest of all carabiner shapes. However, they have a smaller gate opening which makes them less useful for certain applications, such as tying a Münter hitch. Similar to the asymmetric D shape, a pear-shaped carabiner features a symmetrical shape similar to a pear, or the human ear. These ‘biners have very wide gate openings, which makes them very useful for belaying and rappelling. This shape is typically less strong than both D shapes, but thanks to modern manufacturing processes, there are plenty of extremely strong Pear-shaped carabiners available. The original shape of carabiners, the oval isn’t as popular as it once was thanks to the invention of newer and more specialized shapes. However, it’s still very useful for certain applications. The symmetrical design helps to prevent load shifting. The large internal size is also great for carrying gear. However, they tend to have a small gate opening which limits their utility for certain types of climbing. The closure of a carabiner is referred to as the gate, and there are three different configurations available: straight, bent and wire. Straight gates are by far the most popular gate style, and you’ll find them on the majority of quality carabiners. They’re made of a straight piece of aluminum, and they’re ideal for every application. Bent gates are less popular than straight gates, but they’re equally useful. These gates feature a concave bend in the middle, which makes it easier for you to clip your ‘biner to a rope. They’re a popular choice for the rope end of quickdraws. Wiregate carabiners get a bit of a bum rap thanks to they’re stripped down and modest appearance. Many climbers mistake this look for being less strong than straight or bent gates. Meanwhile, most wire gate carabiners are every bit as strong and reliable as their counterparts. However, they tend to be a bit less durable. Wiregate carabiners are also usually lighter. A feature you’ll come across on many popular straight and bent gate carabiners is a keylock. A keylock is a smooth notch along the top end of the carabiner, where the body meets the gate. This smooth area helps to eliminate snagging which can damage your gear, and also leave you susceptible to falls and injury. Keylock ‘biners are usually a few dollars more expensive, but most climbers find this to be a very worthwhile feature. Many carabiners feature a locking mechanism on the gate that prevents them from coming open due to contact with another object or a fall. This feature is critical for use with rappel devices, and they help to add a level of peace of mind every climber is going to be sure to appreciate. While they’re heavier than non-locking models, it’s a small trade-off for most climbers. There are two types of gate locks available. The most popular option is the screw-lock. These models feature a locking mechanism which can be screwed upward to lock the carabiner and prevent it from opening. Most screw-locks are easy to operate with one hand. Auto-locking models are the newest locking style available, and they make it even easier to lock your carabiner. As the name entails, these carabiners lock themselves in place automatically as soon as the gate is closed. The next consideration to make is the size of the carabiner. You’ll find models available in a seemingly endless array of sizes, and each different size is applicable for different functions. In general, the larger the ‘biner, the easier it is to clip and use. But, they’re also heavier and take up more room. Most climbers try to keep a wide range of sizes with them, so they’re covered for virtually every application. Perhaps even more important than size is the gate clearance of a carabiner. This measurement refers to how wide the gate can open when clipping. A wide clearance of 20mm or more can be helpful for HMS applications, but too much clearance can make it more difficult to clip. Serious climbers are always looking to shed weight wherever they can, and even though carabiners are all relatively light, every ounce counts when you’re on the mountain. Unfortunately, there are some caveats with achieving a lighter weight. Many ultra-light carabiners used by hammocks, are made narrower to achieve lighter weight, and this can add unnecessary stress to your rope and result in a shorter lifespan for the rope and also the carabiner. The last thing you’ll want to consider is the strength of the carabiner. Carabiner strength is rated in kilonewtons, and it’s measured along the lengthwise and widthwise axis. Strength is also measured when the carabiner is open. All climbing carabiners must pass strict guidelines put forth by CE and UIAA, so you can rest assured that any carabiner that’s built to these standards is going to be strong enough for anything you’ll need to use it for. But, strength can be a great way to make a final decision on a carabiner if you’re having trouble deciding between a few different models.